Professor Anderson was born in Sydney, Australia. He took his undergraduate degrees in Mathematics and Electrical Engineering at Sydney University, and his doctoral degree in Electrical Engineering at Stanford University. He worked in industry in the United States and at Stanford University before serving as Professor of Electrical Engineering at the University of Newcastle, Australia from 1967 through 1981. At that time, he took up a post as Professor and Head of the Department of Systems Engineering at the Australian National University in Canberra, where he was Director of the Research School of Information Sciences and Engineering from 1994 to 2002. For approximately one year to May 2003, he was the inaugural CEO of the newly formed National ICT Australia, established by the Australian Government through the Department of Communications, Information Technology and the Arts and the Australian Research Council under the Information and Communication Technologies Centre of Excellence program. From May 2003 to June 2006, he served as Chief Scientist of NICTA. He has held many visiting appointments in the United States, Europe and Asia, including the University of California, Berkeley, Stanford University, Yale University, Imperial College, Swiss Federal Institute of Technology, Kyoto University and Tokyo Institute of Technology. 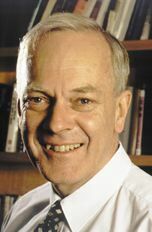 Professor Anderson served as a member of a number of government bodies, including the Australian Science and Technology Council and the Prime Minister's Science, Engineering and Innovation Council. He was also a member of the Board of Cochlear Limited, the world's major supplier of cochlear implants from 1995 to 2005. He is a Fellow of the Australian Academy of Science and Academy of Technological Sciences and Engineering, the Institute of Electrical and Electronic Engineers, and an Honorary Fellow of the Institution of Engineers, Australia. In 1989, he became a Fellow of the Royal Society, London, and in 2002 a Foreign Member of the US National Academy of Engineering. He holds honorary doctorates of the Catholic University of Louvain in Belgium, the Swiss Federal Institute of Technology, and the Universities of Sydney, Melbourne, New South Wales and Newcastle, together with the University of Technology, Sydney. He was appointed an Officer of the Order of Australia in 1993 and a Companion of the Order of Australia in 2016, and awarded the Centennial Medal in 2001. He is also a holder of the Order of the Rising Sun with Neck Rays and Gold Ribbon, from Japan. He retired from the ANU as a Distinguished Professor and was appointed Emeritus Professor in July 2016. At that time he became Distinguished Professor at Hangzhou Dianzi University. His research interests have included many contributions in the area of circuits, signal processing and control, and currently his work focuses on distributed control of multiagent systems, sensor network localization, and econometric modelling.